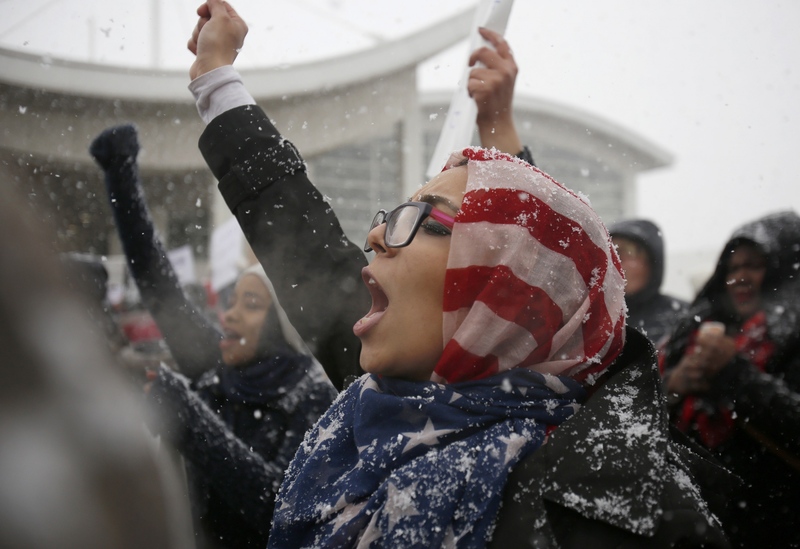 Khulud Fidama, 26, of Dearborn stands with her family outside the McNamara Terminal at Detroit Metropolitan Airport in Romulus, Mich. to protest the travel ban. 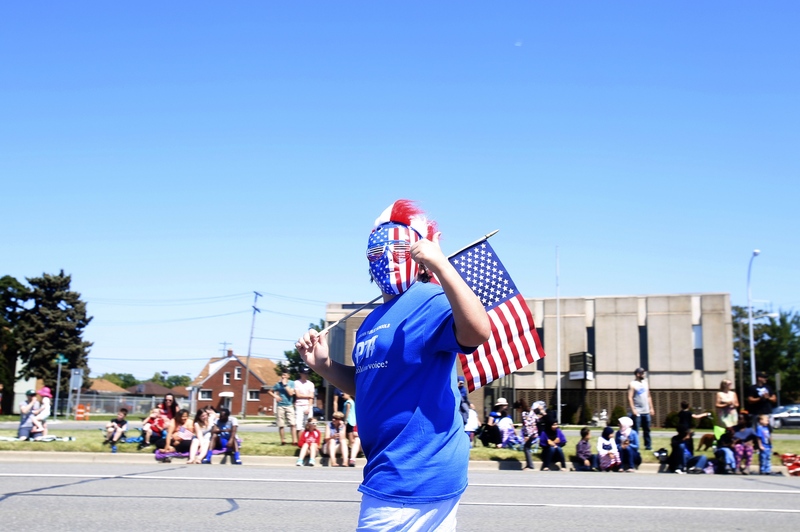 With a fully painted face and carrying a small American flag, a marcher gives a thumbs up to the crowd watching the 93rd Annual Dearborn Memorial Day Parade in Dearborn, Mich. 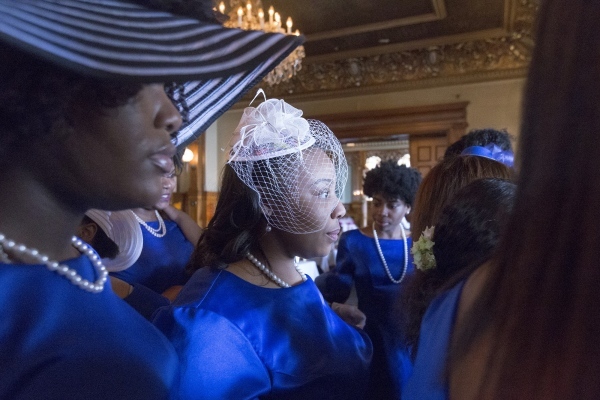 Member of the Achievers Ladies Ensemble and Detroit School of Arts student, Kennedy Adams, 18, center, performs during the Greater Detroit Chapter of The Society Inc.'s tea at the Whitney in Detroit. 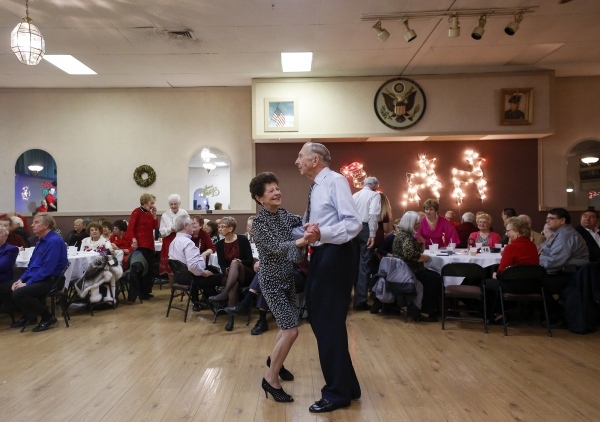 The young singers later learned that a generous donation from Nancy Quay and Sherry Marcy will allow them to perform at Carnegie Hall in New York, New York. 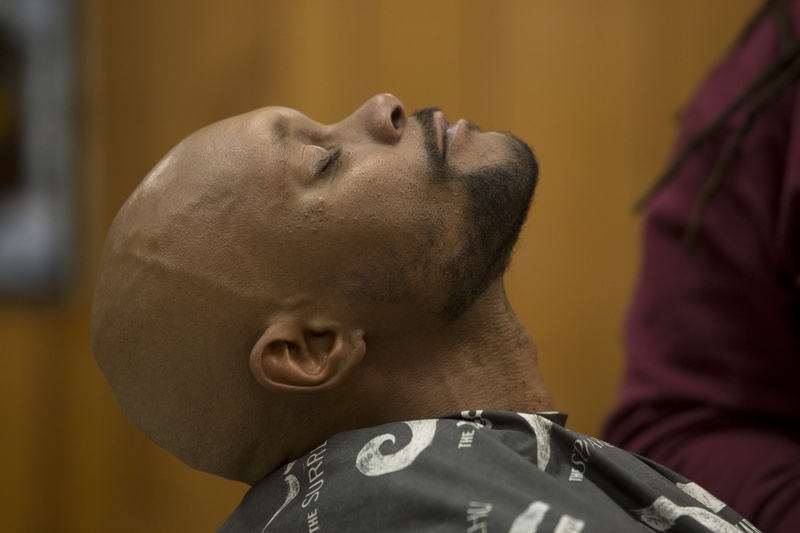 Steven Goodman tilts his head back as Shenika Courtney prepares to trim the rest of his beard at the Isaac Agree Downtown Synagogue in downtown Detroit, Mich.
Lifelong Detroit resident Margaret Terry, 72, and Steve Wonder's first piano teacher, cries with joy while touring her and her brother's new home in Warrendale, Mich.
Ebenezer African Methodist Episcopal or AME First Lady Carol Ann Pettigrew Thomas, left waits for her husband, Pastor Mikarl Thomas Sr. to join her in the car for the Motorcade, which recreates the congress' move from Midtown to its present home at 5151 W. Chicago in Detroit, Mich. 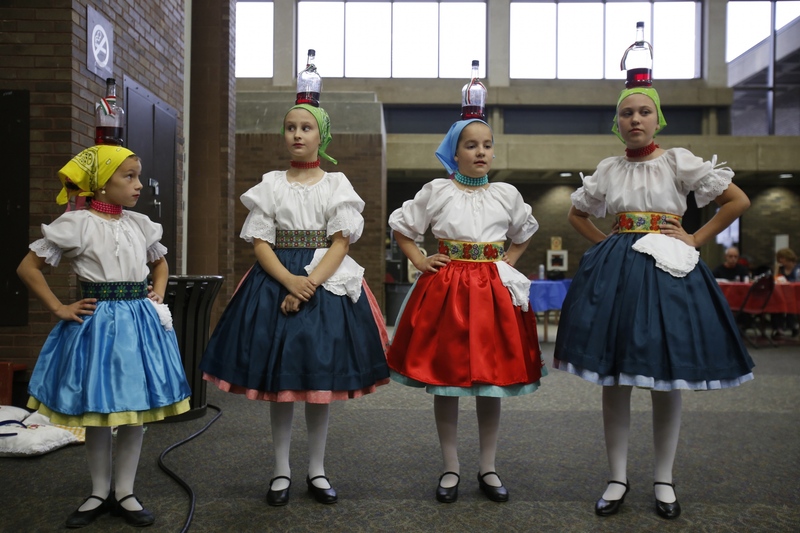 While balancing a glass jug on her head, Doda Simon, left, looks up at the older girls, Eva Fazes, Dorothy Sidau, and Anna Hussey all members of Kis Szivek or Little Hearts, a Hungarian dance ensemble, as they wait off stage before their performance at the 90th annual International Festival in Southfield. 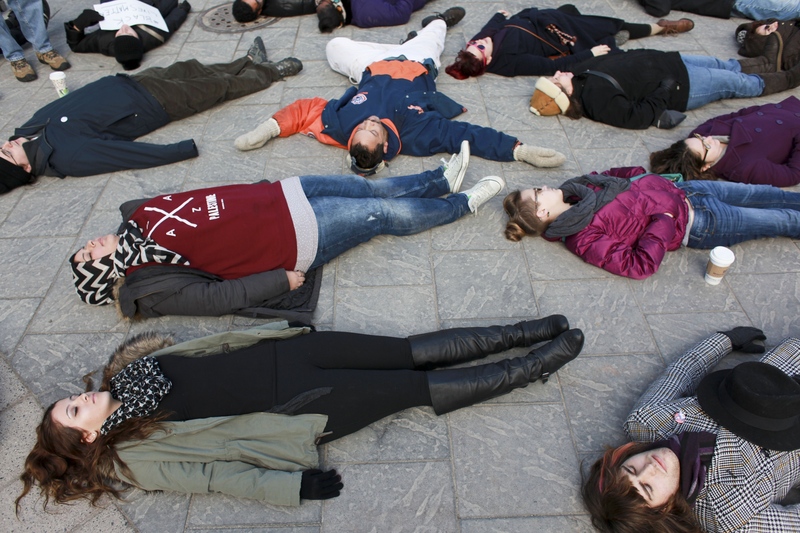 Protestors stage a 'die-in' at Campus Martius Park in downtown Detroit, Mich. in a rally over the non-indictment of Eric Garner, a black New York man who died during a police arrest. Protests continue after last week's non-indictment of a Ferguson police officer. 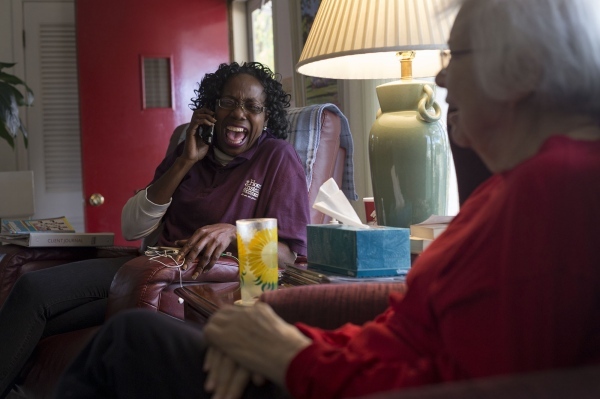 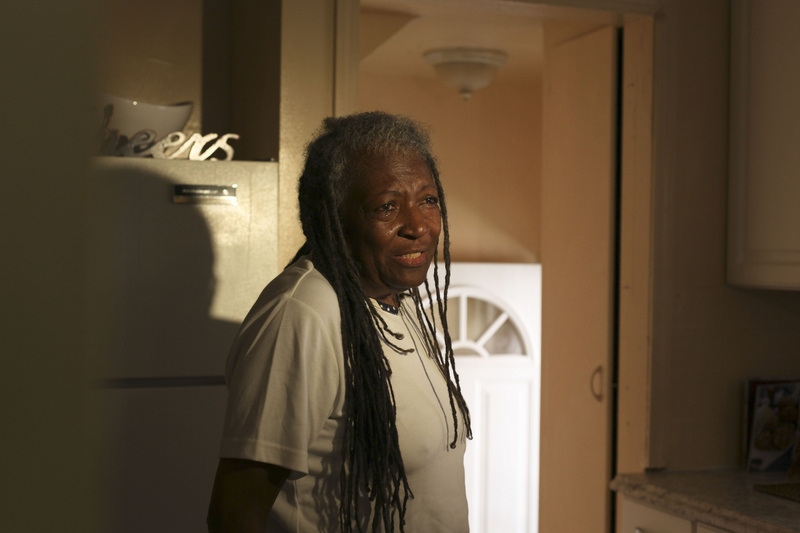 Jackie Lloyd, left, laughs over the phone while Lois Jones watches television on Wednesday afternoon, Nov. 9 at her home in Royal Oak, Mich. Lloyd has been working with Jones a little over two years as a caretaker with Home Instead Senior Care. 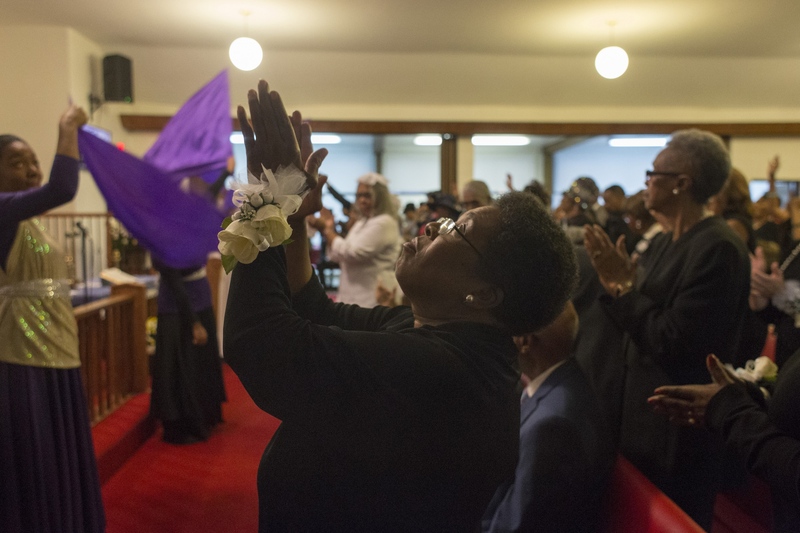 St. Paul African Methodist Episcopal or AME choir director Debra Williams, of Detroit, sends up praise during the church's dedication service in their new location in Grosse Pointe Park, Mich.
Vanessa, left, Iman, and her baby watch in a separate room and through a television as an Imam from their mosque gives a lecture during a prayer session in Playas de Tijuana, Mexico, along the Mexico-U.S. border. 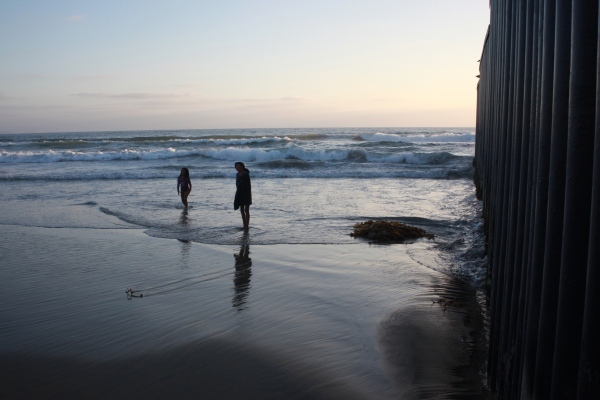 A growing number of Muslims in the Tijuana area has prompted the building of more mosques. Two young girls play near the U.S. - Mexico border wall at Playas de Tijuana, Mexico while the sunsets and tourists leave the beach. 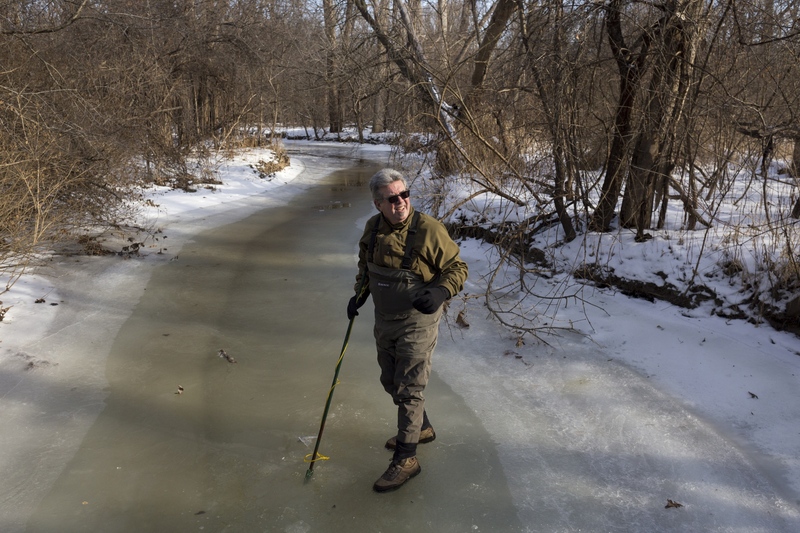 Carl Clark, 64, of Farmington Hills, walks along the frozen Rouge River looking for a way to break through the ice to search for stoneflies at Heritage Park in Farmington Hills, Mich.
“The present generation is missing this,” said Gus Zielinski, dancing with his wife of 56 years, Gerry Zielinski, both of Warren, during the Polka Booster Club of America’s Christmas dance at the Lyskawaw VFW Hall in Dearborn Heights, Mich.
Kaleb Hardy, 14, left, gets help putting his practice jersey over his new shoulder pads, from teammate Spencer Wallace, 14, during Camp Greatness in Detroit, Mich. 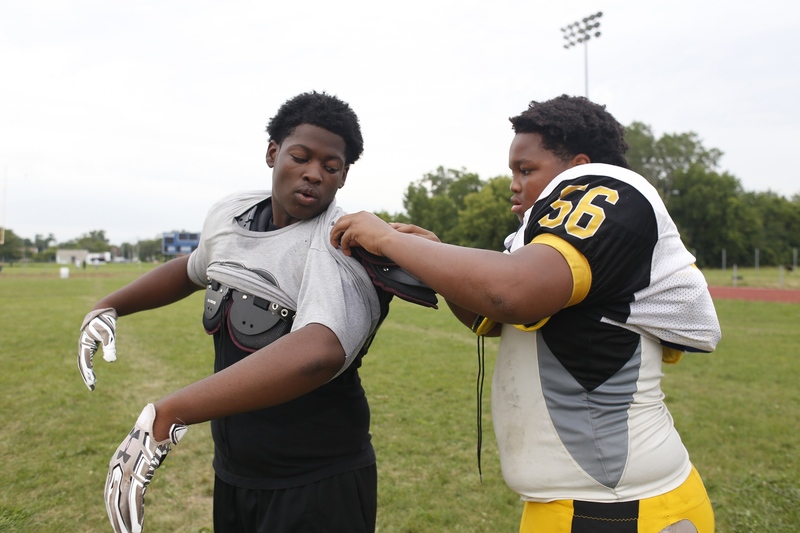 Offensive tackle for the Los Angeles Chargers and Detroit native, Joe Barksdale, helped donate money, school supplies and football gear to students and athletes around Detroit. 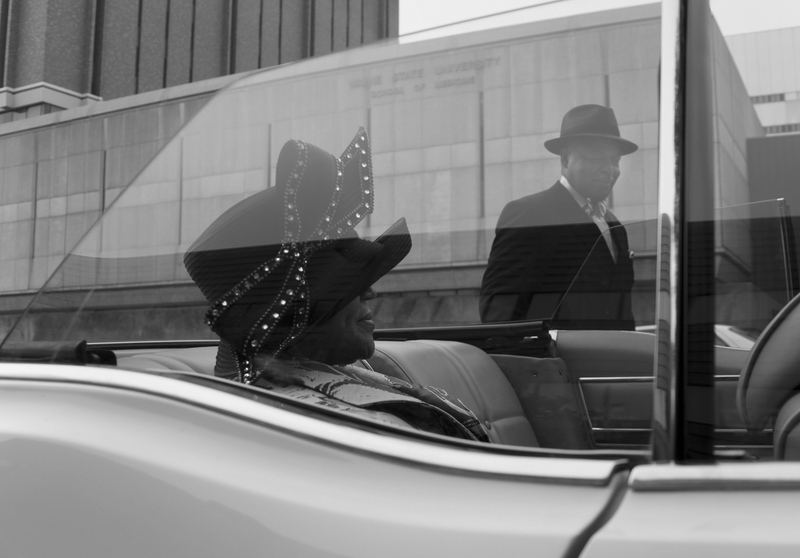 “Detroit is a city full of resiliency and hard work, and that’s what I carry with me now...I have to give back to the city that raised me," said Barksdale. 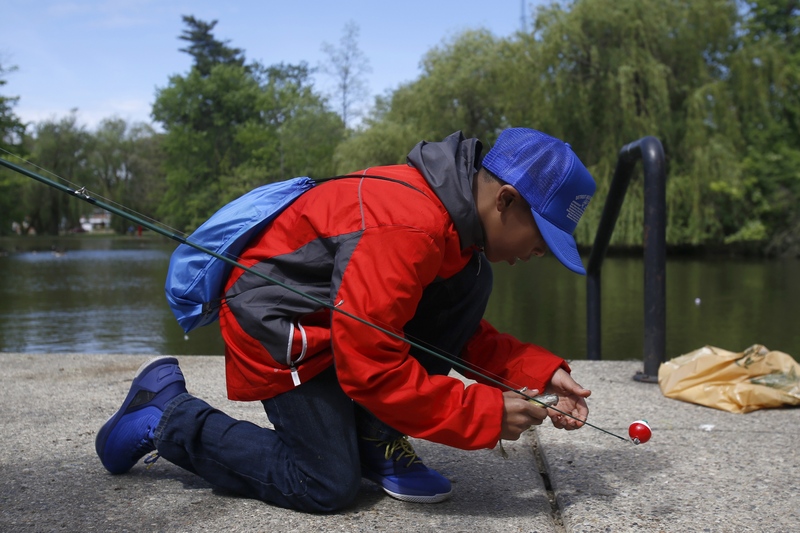 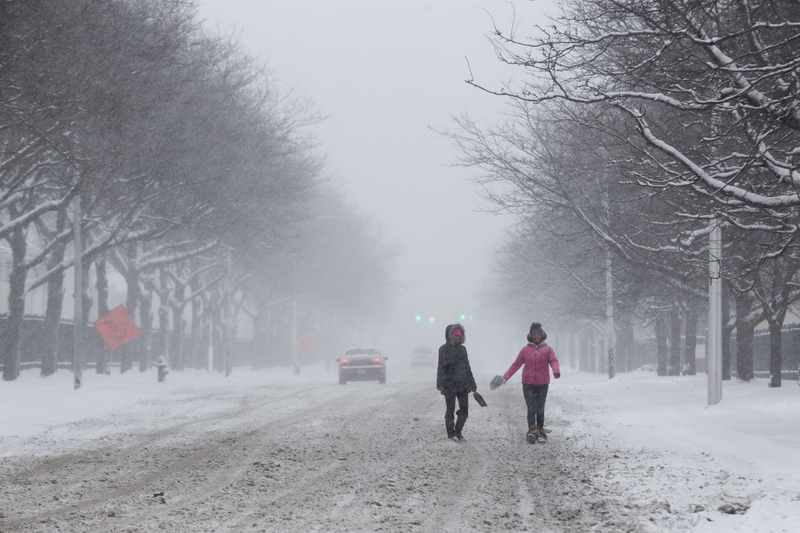 A young boy works hard to unhook a squirming fish he caught during the 21st annual Detroit Area Kids Fishing Derby in Palmer Park in Detroit, Mich.
Two young girls walk through a snow storm in the Woodbridge neighborhood of Detroit, Mich. Detroit Metro had the nation's worst airplane delays and cancellations including 269 cancellations and 542 delays. 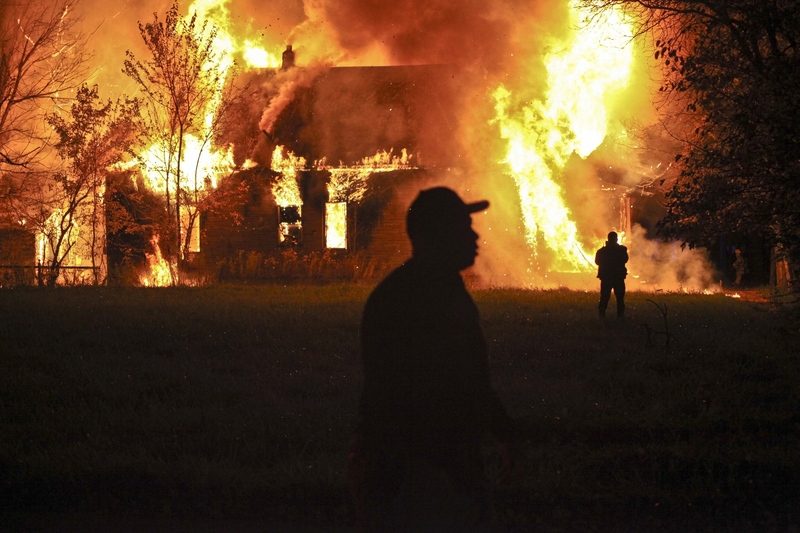 A man walks past an abandoned home completely engulfed in flames on Detroit's Eastside. 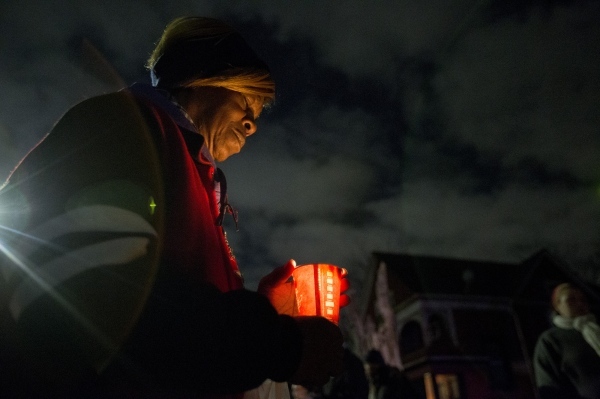 Dianne Pickett of Detroit closes her eyes during a gathering in the Woodbridge neighborhood of Detroit to honor the fallen Wayne State University Police Officer Collin Rose.